Haven't you noticed that if there is something that really strikes your fancy, you find yourself using it throughout your entire house? For me, it's the color blue that makes appearances in every room in my home. For others, it might be Chinoiserie, porcelain vegetables, black and white photography, or...mirror. Yes, mirror. My friend Jean loaned me her copy of The House and Garden Book of Classic Rooms last weekend, and while looking through the book I noticed several photos of the Paris apartment of designer Claude Vicario de la Iglesia. I like the apartment's high style look, but what really caught my eye was the designer's use of mirror throughout much of the apartment! (By the way, I think that exclamation point is warranted as it's not often that you see a home with this much mirror.) Even the bedroom was treated to it, though thankfully not on the ceiling. 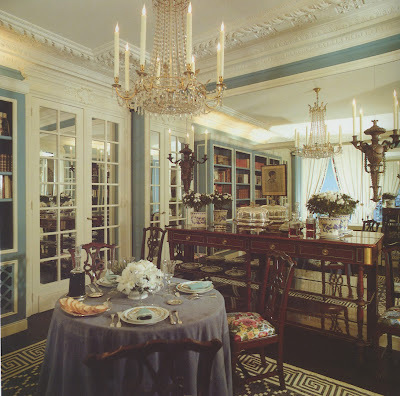 In the dining room/library, seen both above and at the top of the post, mirror lines the wall behind the sideboard as well as the wall that runs perpendicular to the bookshelves. Note too the mirrored panels on the doors. The living room has all kinds of mirror, including a framed one over the fireplace as well as a mirrored wall along one side of the room. Even the door frame is surrounded by mirror. Not to be denied, the bedroom too has mirrored walls both behind the bed and along the side wall, though that wall is curtained. 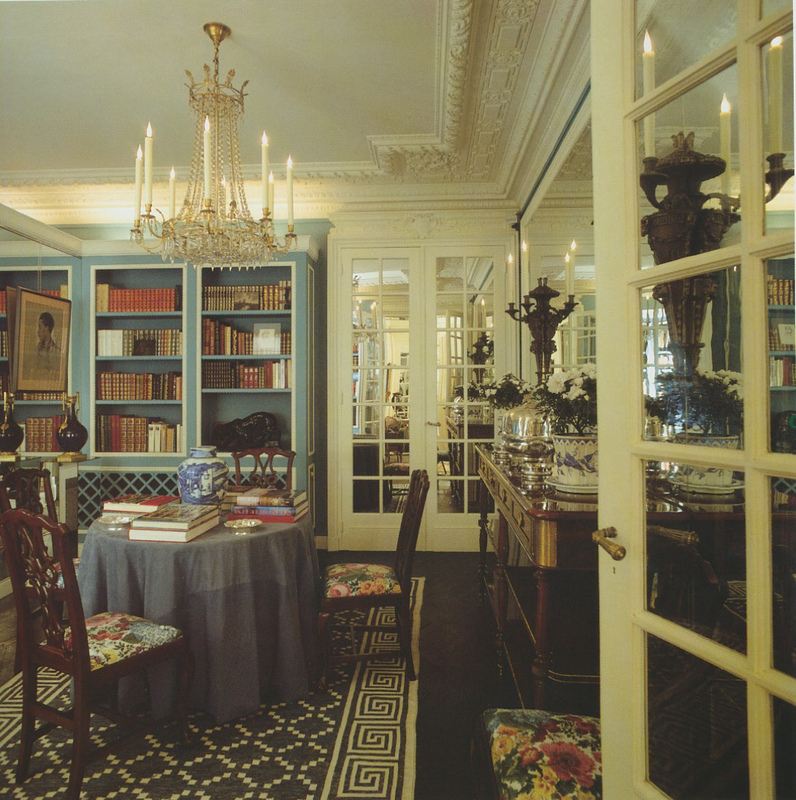 All photos from The House and Garden Book of Classic Rooms by Robert Harling. I really like some mirrored walls and have toyed with the idea in my own house but I don't want to see that much of myself. Great post; just bought the book on the strength of it. 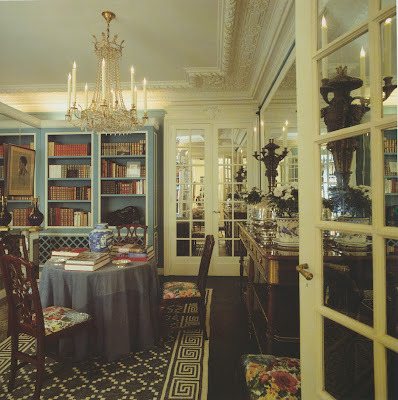 I LOVE mirror; it has a magical quality, and for space challenged New Yorkers, a bit of visual legerdemain is essential. I must admit that large sheets of mirror often leave me cold; they are so obviously "mirror". I prefer a wall to be covered in squares of mirror, either large or smaller, plain or bevel-edged, to give that old Versailles, Hall of Mirrors effect. I did it for a friend's apt. - not hard with some inexpensive J-channel, and bronze buttons to cover the screws and washers that held the mirrors in place at the points where the different panels met. 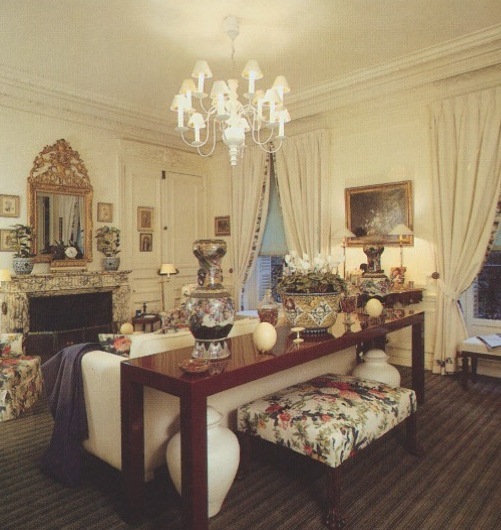 She loved the result, it gave the room the effect of having an enormous, multi-paned window. If you use antiqued or smoked mirror, the reflection is not so insistent. The image you see is almost akin to watching a romantic old movie with a familiar actor on the screen. Quatorze, a very interesting comment. I agree that walls covered in squares of mirror, especially antique mirror, is more elegant. Regarding Chatsworth and its ingenious use of mirror, I wonder if there is a photo of it in a book or online? Just lovely. I think it helps make a room feel larger but more than that it reflects light -always an important quality. I love the use in the french doors as well. I am not a fan of seeing myself in a mirror, however having moved into a small apartment that doesn't have a lot of natural light, I have employed mirrors to bounce the light around and I think it makes a difference. 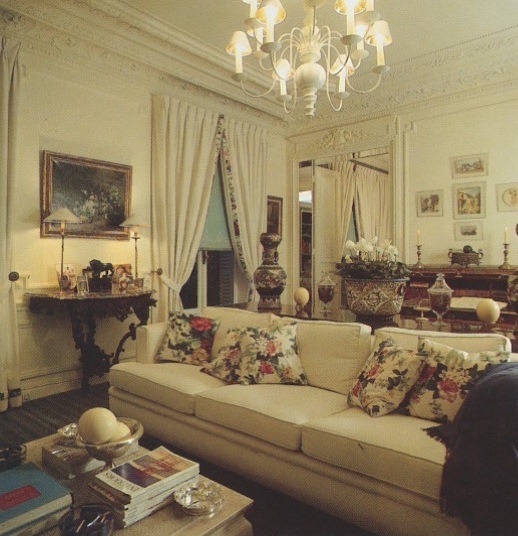 I used mirror a lot in my carrer of interior designer, and i continu using it, but alaways as an architectual element. I come from the "Valeryan S. Rybar school" of New York, and among all what he tought me, the use of mirror is what seduced me the most. It's not always easy to convince clients to use mirror in the decor, because most of the time, people don't have the ability to imagine what mirrors would reflect and add to the decor. Claude, You made wonderful use of mirror in your apartment. It's gorgeous!